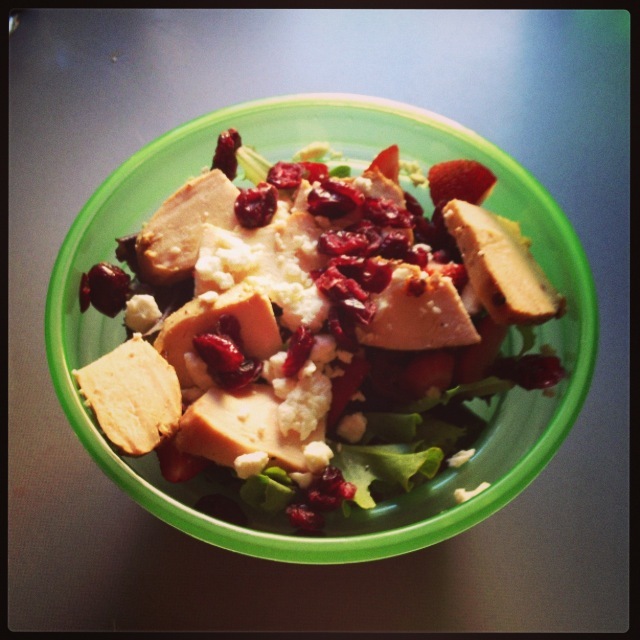 It’s a spring mix salad with grilled lemon-herb chicken with fresh-cut strawberries, dried cranberries and feta cheese. I’m still trying to sort out the portion sizes of stuff and Tuesday was better than Monday and hopefully Wednesday is even better portioned, but overall I’m still impressed I’ve stuck with it. If you don’t know it already, this is a HUGE accomplishment. In general I don’t eat enough vegetables add-on that I despise romaine and iceberg lettuce and you’re starting to get an idea of how much it would take me to make and eat my own salads. I’m not sure how people eat salads everyday, but we’ll see how I do a week at a time. I’m already trying to figure out what I’m going to do next week and I’m thinking the same base with the spring mix and chicken but maybe apples and nuts of some sort. Suffice to say that after last month’s post working out was a bit of a failure. Between family visiting and getting sick I missed almost two weeks and then with work getting super busy at the end of the month I missed a couple more days so it was a bit of a wash, but so far in June I’m going strong and feel like I’m doing better than I was so maybe I needed a bit of a break! So missing dates aside, this month was a good month. I did my incremental increases each week and have seen improvements all around. I’ve also noticed, after the break, my knees aren’t bothering me as much as they were at one point. It wasn’t my knees as much as it was the muscles pulling on my knees causing discomfort and soreness. Once I figured that out I was able to stretch better and more often which alleviated a lot of the discomfort and I guess helped my tendons and muscles catch up as I’ve not noticed as much discomfort this month. The two highlights of the month for me were stringing multiple double-unders together in one grueling workout. Double-unders are when you’re jumping rope and you want the rope to make two complete circles with one jump. Generally, I manage 10-20% of our attempts are (50 attempts = 5-10 successful) and I somehow managed to string 2-3 together in the middle of a particularly grueling workout after some pointers and I can’t wait to do them again. The workout consisted of 50, 40, 30, 20, 10 double-unders/sit ups w/ the DU halved for me for time; time was capped at 15 minutes and I completed 25/50, 20/40 and 15/5 which is a lot! In the first WOD, on the left, it was the first time I’ve actually done the box jumps and didn’t scale down to step ups AND I completed 5 complete rounds which is a little under a 2.5 minutes a round which isn’t too shabby as I was exhausted at the end. And to put this in perspective, by time we got around to the WOD we’d been working on our deadlift which I bumped up to 130# and did 3-4 sets of 5 lifts. So I’m counting it as a win that day! The second WOD, on the right, contains one of my least favorite things on the planet: RUNNING. Seriously, if I ever write an autobiography for any reason I plan on calling it “I Hate Running,” or some form of that. But I did finish the work out and wasn’t too far behind everyone else. I did have to scale the squats from 50 to 30 or I would never have finished, but everything else I kept the same and completed the workout in 22:00. It would’ve gone a lot faster if there was no running involved, but what’s that phrase about what doesn’t kill you makes you stronger? Yeah I’m going to bank on that and hope the running continues to get easier. My biggest goals for this coming month are to stick with the salads/healthier eating at lunch time and to hopefully not miss many days. I’m still seeing improvement which is what matters and I find myself getting antsy when I’m not there and usually am. So It’s definitely becoming habit which is the biggest hurdle! I’m not a big fan of lettuce-based salads, either, so I eat a lot of tomato-based ones instead. I like endives, too, and I can usually get the whole family to eat an endive salad if I mix in walnuts and cheese. Oh I don’t even know what endives are, I’ll have to check them out. My biggest issue with most foods is texture related. I can’t eat raw tomatoes because its an automatic gag reflex. I’ve managed to work my way around to peppers and maybe I’ll try tomatoes again at some point (their acidity is also an issue). Good luck with the yoga, do you do videos or just self lessons? A great site a friend recommended to me is doyogawithme.com if you don’t have one. It gives a lot of filter options. I’m not a fan of iceberg lettuce, but I love romaine. You know, I haven’t had a good salad in so long, and now I really want one. I love a good chicken or steak Caesar salad. YUM. Crunchy, cool lettuce is so refreshing, especially in summer. But yeah, you can make salads out of anything, so you don’t necessarily have to use lettuce. I’m very proud of your workouts! GO, YOU! Thanks and I’ll have to look at steak, I always forget you can do steak on salads. I’ve been good this week not doing any dressing and I’m trying to stick to that so the more flavorful the stuff I put in it the better! I like salads to a certain degree, but not sure I can have one every day. Like you, I’m not a huge veggie fan. I try to eat them, but sometimes I’m grinning and bearing it and not enjoying. Keep up the motivation. Life can get in the way, but don’t let that get you down. Yup and I have to tell myself that everyday. So I had a rough week let’s make this one better. Salad wise I don’t mind, but I might need to plan for two different types in one week so that there is some variety. You’re putting everyone to shame. I also need to sort my eating habits out – by eating more and more healthy stuff as well. I had a good lunch today but only cos I paid for it. I do like salads but not the leafy stuff so much so I must experiment. Bean salads or quinioa, couscous salads too and mmmn feta cheese. I’m just a lazy bum. I also don’t like raw tomatoes either… they’re too squelchy. When I was veggie I was forced to eat a lot more vegetables than I otherwise would have. I’m a failed veggie… considering I like my steak practically raw I don’t think I was meant to be one. But cutting out meat did make me venture out of my comfort zone with food and I like a lot more vegetables since then. Good for you! I’ve gotten a bit better at the whole gym thing, but I definitely struggle with food. For a while I’m good with portion control, but not necessarily the content of my meal. And I enjoy a good salad every now and again, but I definitely couldn’t do it every day (same thing with soup). Yeah the salads are getting to me but I’m pushing through and super proud as I’m staying away from dressings. I joined fitrocracy in the beta stages but didn’t stick with it as there was so little customizability in the work outs you could add. I’m sure it’s reached the critical capacity point that people have now added or demanded a lot more me added.